This post follows on from the previous post Did European settlers loathe the forest? While I am largely satisfied with the idea that European settlers destroyed the forest driven by the need to make productive use of the land, rather than any deep-seated loathing of it or what it represented, this still does not explain the extent to which forest – lowland forest especially – was destroyed. It was, by and large, decimated. Most farms were left virtually treeless, requiring farmers to hastily plant shelter belts when they found that their land had become suddenly more windy, which could be a problem for soil stability, especially in the coastal sand country. This outcome is difficult to explain, because it runs counter to the farming traditions of the British Isles and wider Europe, from which most settlers originated. It was a shock even to visitors from the British Isles how devoid the New Zealand countryside was of trees or vegetation. So, why, despite coming largely from the British Isles, did the settler farmers in New Zealand depart from the customary farming practice of leaving copses or hedges to provide shelter for stock, and from the weather generally? I have no explanation for this, except to posit that it may stem from the fact that many settlers were not farmers. Certainly in the Manawatu, many were from working class backgrounds, who had worked in cities and owned no land. As the last post explored, they came to New Zealand to carve out a better life for themselves. This lack of farming knowledge, along with the very different environmental conditions they encountered in this largely forested land, might explain why their transformation of the environment was so complete; even to the extent that it departed from established farming wisdom in their home countries. And it is interesting that, despite more than 80 years passing since these observations were made, many farms today remain largely devoid of vegetation – though this is changing as more and more farmers recognise the many benefits that trees (particularly indigenous) provide. * Organisations such as Landcare Trust are also working with landowners to introduce more diversity on to farms and realise these benefits. * often referred to as “ecosystem services”, these range from providing shelter for stock, providing habitat for birds and other indigenous species, land stability, stream-bank (riparian) protection, aesthetic value, and even honey production. Previous Article Did European settlers loathe the forest? If there is a better answer to the question as to why they thought it good to inflict such tragic devastation, I have no idea as to what it might be. This is a very interesting idea, and it’s probably a big part of the picture. However, I’m not sure you can dismiss the “fear and loathing” aspect entirely. A friend who grew up in northern England but has lived here for more than 40 years told me the other day that she still finds native bush spooky. We were riding past a lovely patch at the time, and she said that while she could admire it from afar, she didn’t like being in it because it’s so dense and unlike the “proper” deciduous forests she grew up with. It’s also interesting to ponder why the practices differed in different parts of NZ. Here in Northland, many paddocks have trees in them – either stand-alone exotic or native trees, or small patches of bush (sometimes fenced off, but often grazed), yet in other parts of the country you see paddock after paddock without a single tree. Thanks for your thoughts Adelia. It is interesting that more recent immigrants from England still feel this way towards NZ bush. I suspect many of the early settlers also felt this way (pretty from afar, oppressive and gloomy from within). However, the point I am making is that however early settlers felt about the NZ bush (I have no doubt that many did harbour negative feelings towards it), it was subsidiary to the economic imperative to clear it. For one thing, given the back-breaking effort required to clear a farm of forest, with its dense layers of undergrowth, settlers are unlikely to have done it simply because they disliked it; they did it because they felt compelled to, in order to make a living from the land. 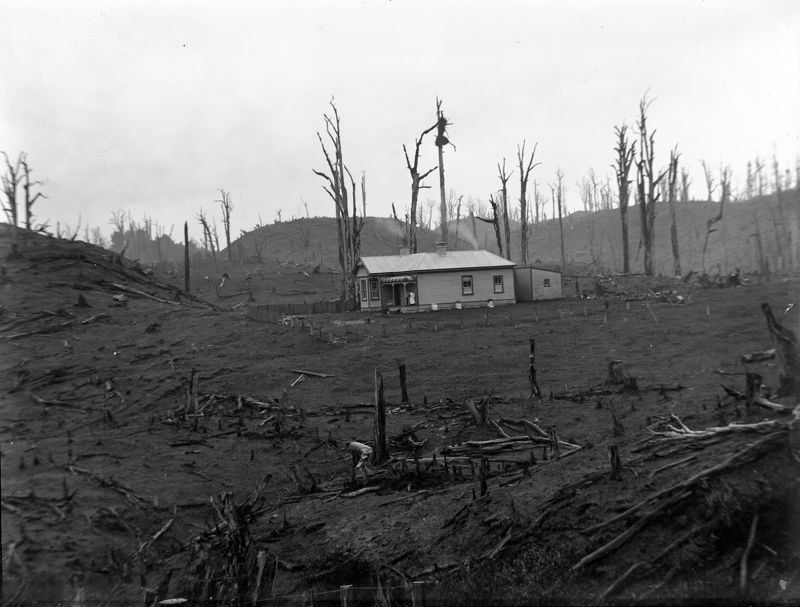 And because fire was widely used as a tool to clear bush, particularly in the North Island, it was difficult to be “selective” about what was destroyed and what was retained. Hi there, I would like to use this image in an assignment – are you able to tell me the source?